I didn’t grow up on a farm, but my family has a long history in agriculture and I grew up in Missouri and Illinois, where farms were abundant. In the summer you couldn’t drive anywhere in central Illinois without seeing corn and soybean fields, and detasseling was a common summer job for teens. In the fall the stalks would brown just like the trees, and the farmers removed them, leaving the fields bare. Midwest winters were cold, often bitter, with plenty of snow. Spring always brought relief as the rains came, trees started to green, and flowers spread their color. Then planting started over again. My soul is tied to the seasons, and I didn’t realize it until I worked abroad and lived in places that didn’t have winter, where the only thing that defined different times of year was the amount of rainfall. I missed the changing of seasons and all that went along with it. I missed the foods of each season, the changing temperatures, the snow, the smell and crisp feel of fall air, the joy of seeing the first tree blossom in the spring. So I’ve started visiting farms and wineries in Northern Virginia and making pictures, trying to tell the story of each season on the farm, showing how it changes. And whenever possible, I bring home food from each farm and cook with it. Every farm is unique. Every farm has a story. I want to tell the stories of farms in Northern Virginia through my camera lens. This August the raspberry canes were bending down under the weight of all the berries, most of which were plump and brilliant red. 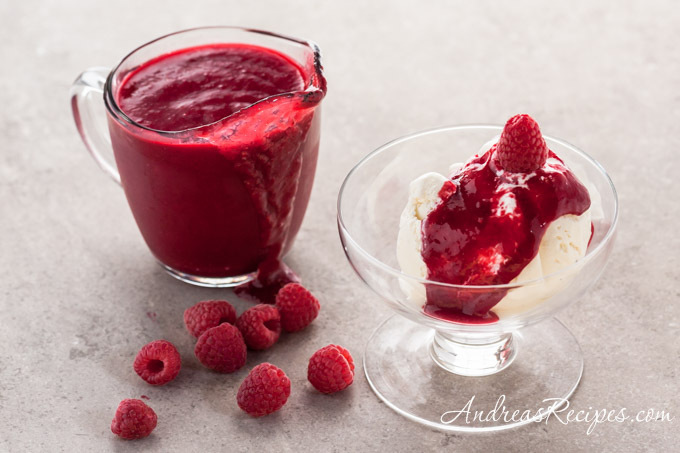 The Heritage berries had a bright, tart flavor that was perfect for this slightly sweet raspberry sauce. A little tartness remains, just enough to contrast with ice cream, cheesecake, and other sweet desserts. Put the raspberries in the saucepan. Whisk together the sugar and arrowroot and add to the raspberries. Stir in the lemon juice juice and water and bring to a boil. Reduce heat and simmer while stirring until the berries break down and the sauce thickens, about 10 to 15 minutes. Remove from the heat and allow to cool. The sauce will continue to thicken as it cools. Puree the sauce in a blender or with a handheld immersion blender, then strain it through a fine sieve. Serve warm or cold. The sauce will keep in the refrigerator for up to two weeks. the color of that sauce is gorgeous! Thanks Alanna, it’s true, I’ve got some Midwest roots. I was born in Virginia and spent most of my childhood moving around between Chicago, KC, Moberly, and Decatur, IL. Yes, that’s Penny’s phrase that I picked up from hearing her speak live and from her CreativeLive workshop. She really inspired me to continue working on my photography and to see it differently. I will happily join you for this ride. Such beautiful photos, and it’s even better when you can bring a taste of each farm home. Thanks T.W. Always glad to have you along. What a wonderful project to work on. I have several relatives who live in VA, and some of their inlaws live in Loudoun County. I’ve only visited once, but loved the countryside. 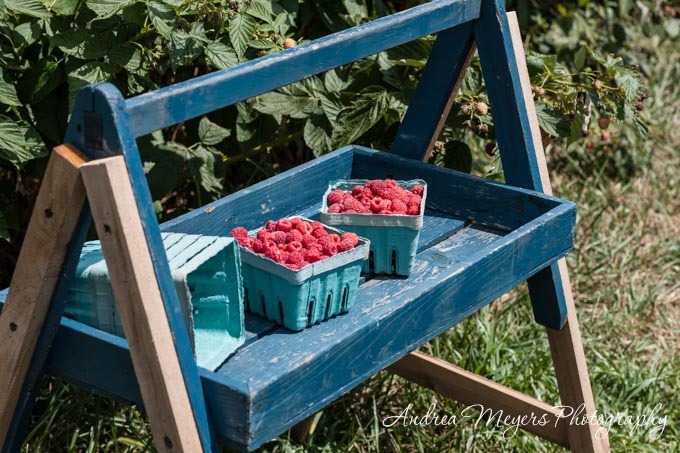 Love raspberry sauce — what color!